This essay proposes that the aesthetic model of cloud as metaphor for online services should be reconsidered. Reference this essay: Speed, Chris. “The Event as Market.” In Leonardo Electronic Almanac 22, no. 1, edited by Lanfranco Aceti, Paul Thomas, and Edward Colless. Cambridge, MA: LEA / MIT Press, 2017. The concept of ‘data-value constellations’ is analyzed in the context of how our interaction with objects and services that are connected through network technologies are part of these value constellations. It is in these complex markets that any concept of an aesthetic is relational and dependent upon the participant’s place within the market, as well as the incentives keeping them engaged. The essay uses the the backdrop of the ‘Internet of Things’ as a context in which the market as both an aesthetic and an experience can be most easily understood. Introduced in 1999, the term ‘Internet of Things’ (IoT) is now beginning to make sense to businesses, organizations, and the general public, as the flow of data between people, internet services, and smart objects begins to influence the many products and systems that make up the world around us and support our daily life. The stepping stones toward living within a network-based society that were afforded by personal devices—from smart phones and tablets to personal health devices—were all extrapolations of a PC-based experience of the Internet. However, new smart objects are already beginning to become part of our routines before they are even considered as computers. From bedside table lamps that are connected to friends and family to thermostats that tell you that you’ve left your heating on, data is transforming the relationship between people and objects. The complex constellations of material artifacts that are connected to everyday practices, datasets gathered in real time, and algorithms that identify patterns constitute openings to new markets in which different kinds of value are exchanged. In many cases, we are beginning to understand how value is constructed as we use software. For example, social media users are becoming aware of the many pros and cons of exchanging social values on Facebook, while Trip Advisor users now understand the implications of their liking, disliking, and commenting upon the economic values of hotels. However, as websites and applications come to be replaced by objects that we use in everyday life, such as those involved in making tea, taking a shower, or getting on the bus, it is less clear how the data derived from our interactions constructs value and is ‘traded’ between services. This disjuncture in the flow of value represents new and emerging opportunities that are defining how we engage with cloud-based services. New markets are being developed that generate value between the social practices that constitute mundane aspects of our lives and the products and services that support them. This is true, for example, of the Google Nest intelligent thermostat, which learns how you live and promises to save you money and energy, and of the Four Square and Swarm apps, which encourage users to ‘check-in’ to places that they visit, thereby helping to build the databases of places that now appear in navigation applications such as Apple Maps. In both cases, the data produced through personal and social activities is exchanged into value that constitutes new market content. In these market models, the rewards for sharing data come in one form, whilst the same data can be used by service providers to build entirely different products for others. The term ‘data-value constellations’ describes how, rather than existing in linear value-chains of production and consumption, artifacts are now part of networks. The term extends Normann and Ramirez’s  phrase ‘value constellations,’ which describes the new economic patterns that emerged at the end of the twentieth century, as globalization and new technologies led to new ways of creating value. Recognizing the role of co-creation of value within networks, Normann and Ramierz highlight that “successful companies conceive of strategy as systematic social innovation: the continuous design and redesign of complex business systems.” (The emphasis is mine.) Within these systems, the value-chains that map the linear passage of products are being superseded by complex social and environmental connections as the passage of data becomes as important as the passage of the objects themselves. Writing on value, Ng describes how new economic opportunities will increasingly capitalize upon social contexts that are becoming visible through the advent of ubiquitous computing. Described as ‘contextual archetypes,’ Ng suggests that, within the Internet of Things (IoT), objects change their role from being symbolic and functional to becoming agents within markets. This radical shift from vertical to horizontal lines of consumption means that objects within an IoT are elevated to the role of actors within our networks of distribution and sharing. As objects become online entities, it is likely that within any given social circumstance there will be numerous markets operating, as the network allows everybody to trade data according to the needs of the many people within that network. As the smart phones we carry develop data about who and where we are, what we like, what we are in the proximity of, what we are using, and how we use it, new services will be offered in exchange for parts of this personal data. These experiences, whether we adopt them as care and play services, cheap deals, or the provision of products, will constitute our experience of the cloud. Therefore, any consideration of the aesthetics of the cloud as metaphor for online data exchange needs to take into account the physical interactions that are part of these exchanges. Throughout the summer of 2013, the author and a research team from the University of Edinburgh and University College London developed an ethnographic study to inform the design of an intervention of a device for exploring haggling practices in an Oxfam shop^ ^ in Manchester, UK. The focus of the study was to understand what forms of engagement took place in the store between the shopper and shop assistant that were relevant to increasing and decreasing the value of objects. As customers equipped with smartphones checked online prices of equivalent goods and contested a price in the store, shop assistants and Oxfam volunteers were found to offer stories not only about the item’s origins, but also about what it might now be worth on eBay, its rarity, and the convenience of being able to walk away with the item immediately; they would also explain that a portion of the proceeds from the sale would go toward goods and services provided by Oxfam’s aid programs. On occasion, the shop assistant would lower a price in order to make a sale, but the research revealed that this was rare and against Oxfam policy. This meant that the complex storytelling that informed customers about the overall mission of the international charity didn’t always lead to a sale. With evidence supporting this observation, the research team began to investigate how the process of haggling highlights multiple aspects of the goods for sale. 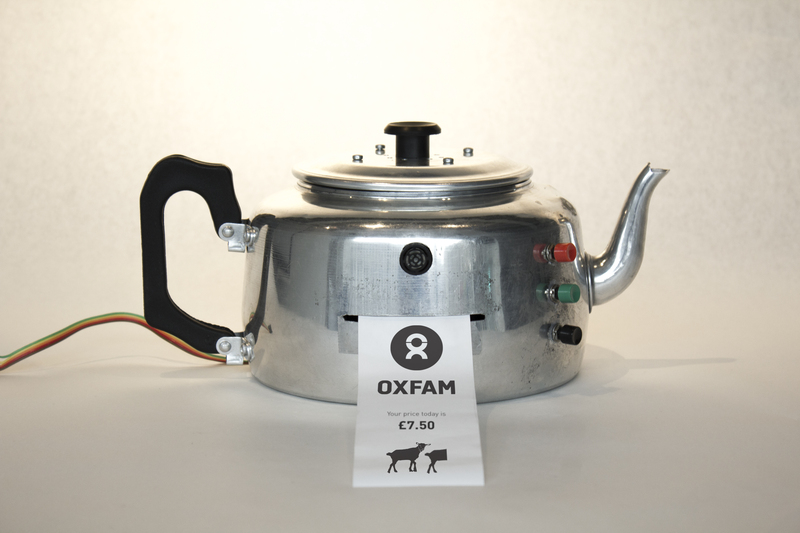 This would later inform the development of a design intervention that encouraged customers to bargain, but in a manner that elicited stories about the object and imparted Oxfam’s mission values. Haggling is an economic interaction in which neither the buyer nor seller of a product or service initially knows the price that the item will be sold for. Haggling is an alternative pricing strategy to fixed prices or auctions. It allows for price discrimination, a process whereby a seller can charge a higher price to a buyer who is more eager (by being richer or more desperate, for example) than another. Although haggling has largely disappeared from Western shopping practices, the advent of smartphones has provided an opportunity for its return, given that smartphones enable shoppers to check prices, availability, alternatives, etc. Given that secondhand shops like Oxfam lack the marketing budgets required to innovate and develop strategies to combat the ‘showrooming’   that is now commonplace, the design team developed a ‘Haggle-O-Tron’ designed to encourage shoppers to try haggling over secondhand goods. The Oxfam Haggle-O-Tron took the form of a secondhand teapot. The Haggle-O-Tron interacted with the user through a series of noises including whistles, sighs, and hmms reminiscent of those made by haggling shoppers. In the first iteration of the Haggle-O-Tron, a researcher engaged with the shopper through a video camera and microphone installed in the teapot (see fig. 1). The researcher was able to communicate with the shopper via a printed, receipt-like paper-stream that constructed a story about value. The Haggle-O-Tron represented a new type of smart object that was central to the mediation of value through the sharing of past, present, and future data. Highly analogue in its manifestation, the Haggle-O-Tron demonstrated how interacting with network objects can negotiate market values and encourage a sale. Figure 1. Version 2 of the Haggle-O-Tron with thermal printer, loudspeaker, and buttons to increase, decrease, and confirm bids. © Fionn Tynan-O'Mahony, 2016. Used with permission. Throughout the summer of 2014, the author and his family were the subjects of a study for a large consortium project. The study required them to attach sensors to parts of their home. A member of the design team for the project, the author, along with the rest of the Edinburgh-based team, worked to develop a toilet-roll holder that would record the amount of toilet paper on the roll that was in use and send this data to an online database. From the fifth of April to the time of authoring this essay, the amount of toilet paper in one of the author’s bathrooms has been available online at http://dev.modusdeus.com/toilet/vis/. The smart toilet-roll holder was constructed using the Electric Imp cloud service and embedded hardware and software platform, and features an infrared sensor for detecting the amount of paper on the roll. As more toilet paper is used, the distance between the paper and roll, which sits on a spindle, grows. Figure 2 demonstrates “the rate of” use of toilet paper, with drops in data associated with use of the paper. Figure 2. An example of output of the toilet-roll holder. Full toilet rolls can be identified as having the highest value on the Y-axis, and significant use of the toilet roll can be identified by drops in the data. © Chris Speed, 2016. Used with permission. Living with the smart toilet-roll holder and its data, however, proved to be far more disruptive than anticipated. Although it is too early for those involved in the research project to understand how this personal data contributed to building a domestic market for selling such data, the social impact was significant. Originally identified by the research team as being simpler to build than a ‘smart’ fridge or other domestic container that holds multiple products, the smart toilet roll is at the center of highly personal practices that take place behind locked doors. Viewing the online graph, one can clearly identify events that require significant amounts of toilet paper, from which it is possible to infer particular toilet activities (see Fig. 3). 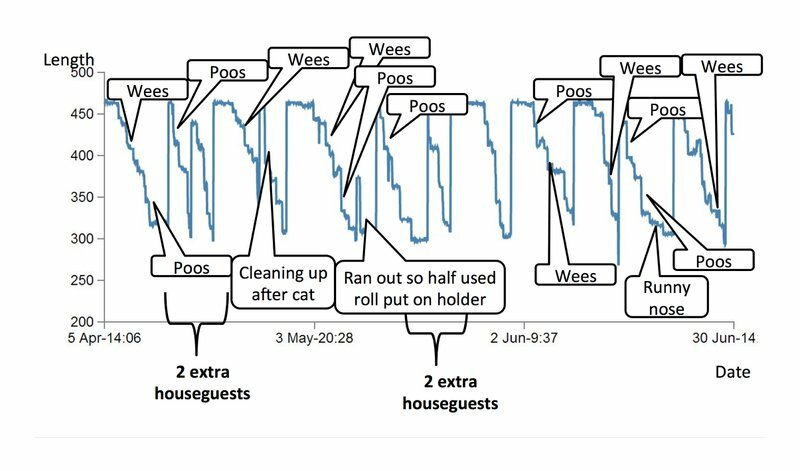 Upon further analysis, the graph revealed to the author and his family (all of whom agreed to the study and to sharing the data) a series of likely events including cleaning up after cats, running out of toilet paper, hosting extra houseguests, and having runny noses. Figure 3. Toilet roll data, with estimates of usage patterns by householders. © Chris Speed & Glenn Parry, 2016. Used with permission. Although the author’s family members are quite happy share this data, when correlated with other datasets, the same data could identify individuals and lead to a loss of privacy. On one occasion in July 2014, while the family was away on holiday, the software engineer who developed the device called the author to tell him of new activity on the server. Following a quick conversation with his partner, the author concluded that the activity coincided with the fortnightly visit of the housecleaner. Such an event highlights the complex markets that surround objects that are connected to the internet and distribute data. Although the family provided their consent to gather this data, visitors—especially those who used the toilet—did not. In addition to the ethical implications, the event also highlighted how connected objects can have functions beyond sensing the material that they are designed to. From the perspective of the software engineer, being alerted to the use of the toilet roll was similar to hearing a burglar alarm, with the data indicative of a potential intruder. The toilet-roll holder and its connected database represent a suite of new technologies that are already available to buy. 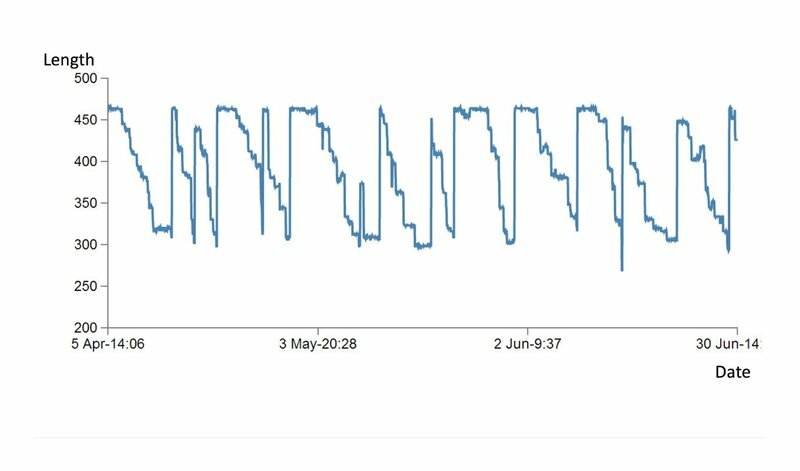 While it is not surprising that collecting toilet-roll data led to social disruption for the author’s family given the personal nature of using toilet paper, we should assume that all manner of conclusions may be drawn from even the most apparently benign sensors—from thermostats to toasters. These include the the realization that one’s personal connected object might not be so personal after all; in reality, any object connected to the internet is in fact everybody else’s because the value of the data that the object produces outweighs its perceived function. The implications for models of privacy are tremendous: all of our lives become extensions of a marketplace in which there is demand for information about the most obscure and personal aspects of our lives. Just how the Internet of Things will impact our daily practices is beginning to be understood, as demonstrated by data being used to effect the value of goods and by the potential for individuals to trade personal data. Heralded as the next paradigm of the internet, the connected objects that collect data as we go about our lives are central to the development of new kinds of markets that will define our relationship with cloud services. It is never entirely clear how products that provide incentives to give data away are funded, or what companies do with our data once we enter such an agreement. The ways in which we use things are already part of a complex web of data-value constellations wherein we hope that we are getting value for both our money and our data. Prototype technologies like the Haggle-O-Tron exploit this opportunity, but do so through refined and easy-to-grasp processes that are linked to existing buying mediums such as the receipt, which they in turn use to project stories that effect value and assist in making a sale. Conversely, the connected toilet-roll holder demonstrates the level of social disruption likely to occur as it becomes easier to identify personal information through the correlation of data from multiple sensors. The aim of both projects is not simply to provide people with more information, but also to explore new cultural practices with the aim of changing behaviors surrounding the valuation of data. While the Haggle-O-Tron hopes to foster more sustainable practices, the toilet-roll holder demonstrates the complex roles of participation within the production of data. Returning to the theme of the cloud as metaphor, this essay asserts that any concept of an aesthetic associated with cloud-based experiences should consider the aesthetics of these new forms of markets. That is, such aesthetic thinking needs to address the markets that involve objects within social practices that, along with the algorithms of the stakeholders involved, mediate values to keep the market sustainable. Participants in such markets should consider the aesthetics of the experiences that constitute the trading of values, from the personal to the social and from the economic to the environmental. Richard Normann and Rafael Ramírez, “From Value Chain to Value Constellation: Designing Interactive Strategy,” Harvard Business Review 71, no 4. (1993): 65–77. Stephen L. Vargo and Robert F. Lusch, “Evolving to a New Dominant Logic for Marketing,” Journal of Marketing, 68 (2004): 1–17. Irene Ng Value & Worth: Creating New Markets in the Digital Economy, (Cambridge: Innovorsa Press, 2014). Jennifer D. Chandler and Stephen L. Vargo, “Contextualization and value-in-context: How context frames exchange,” Marketing Theory 11, no 1. (2011): 35–49. Oxfam are a UK based charity that has 700 shops in towns and cities across England, Scotland and Wales. The shops receive donations of clothes and artifacts from people, and sell them on to new owners as second-hand goods. Showrooming is the practice of examining goods in a high street store without purchasing them before shopping online to find a lower price for the same item. Chris Speed, Mark Hartswood, Eric Laurier, Siobhan Magee, Martin de Jode, and Andrew Hudson-Smith, “The Haggle-O-Tron: Design Intervention in Secondhand Retail,” in Proceedings of the 2014 Companion Publication on Designing Interactive Systems DIS Companion '14. ACM, New York (2014): 137–140. Taiichi Ohno, Toyota Production System: Beyond Large-Scale Production (Portland, OR: Productivity Press: 1995). The Haggle-O-Tron study was part of the Internet of SecondHand Things project with Eric Laurier, Mark Hartswood, Siobhan Magee, Martin De Jode, Andy Hudson-Smith, and Fionn Tynan-O’Mahony (http://www.iosht.org/dis_2014.html); was made possible by the volunteers, employees, and shoppers within the Oxfam shop in Manchester, UK; and was supported by an RCUK Digital Economy grant. The toilet-roll holder is part of the RCUK-funded Hub of All Things project (http://hubofallthings.com). Chris Speed is Chair of Design Informatics at the University of Edinburgh, where his research focuses upon the Network Society, Digital Art and Technology, and The Internet of Things. Chris has sustained a critical enquiry into how network technology can engage with the fields of art, design, and social experience through a variety of international digital art exhibitions, funded research projects, books, journals, and conferences. At present, Chris is working on funded projects that engage with the flow of food across cities, an internet of cars, turning printers into clocks, and a persistent argument that chickens are actually robots. Chris is co-editor of the journal Ubiquity and leads the Design Informatics Research Centre, home to a combination of researchers working across the fields of interaction design, temporal design, anthropology, software engineering, and digital architecture, as well as PhD, MA/MFA, MSc, and Advanced MSc programs.